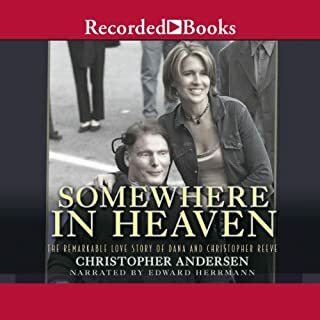 Christopher Andersen, senior editor for People and acclaimed author of numerous books, spotlights Dana and Christopher Reeve - examining their unique partnership and the romance, faith, and fortitude that defined it. This bittersweet saga shows the couple bearing the painful hand of providence with unbelievable grace, courage, and humor. The author that put this book together for the Reeves family put it together very well. The narration was flawless as well as excellent characterization. I've purchased one other Audio CD is the past; the story line was good, but the narration was done by one person acting out all of the characters, including a five year old child--very cheesy needles to say. But "Some Where In Heaven" had me applauding one minute and tearing up the next; an excellent buy and I've already recommended this audio version to several of my friends.